Drivers, Cyclists & Pedestrians need to learn to share! Why can’t we all just get along when it comes to sharing the road, the sidewalk or the pedestrian mall? Why does every new urban infrastructure project proposal become a battle? The latest controversy is over the proposed City Centre Cycling Track Plan – seems like nobody is happy with what is being proposed. How can this be? Shouldn’t somebody be happy? I attended the first Open House at Hotel Arts and I have to admit I was disappointed. What was missing was a real debate to allow the public to share and discuss their various perspectives. It seemed everyone came with their tribe, looked at the information panels and then left without any exchange of ideas between the opposing viewpoints. I was looking for someone to lead a group discussion of the various pros and cons of the options being presented and how the proposed routes were determined, rather than a bunch of one-on-one discussions with various City representatives. Seems to me there would be value to having all of the ideas and opinions on the table via on open group discussion, rather than everyone going away and blogging their objections or chatting with the media. At last April's Calgary Underground Film Festival, many of the patrons came downtown on their bikes - even at night. One of the more controversial proposals of the City Centre Cycle Track Plan is to allow bike traffic on Stephen Avenue Walk. The Calgary Downtown Association is dead set against it and they were supported by a Calgary Herald editorial. I would like to remind everyone the introduction of vehicular traffic on Stephen Avenue was a controversial experiment in the early ‘90s to see if the addition of cars might help what was then a struggling, “pedestrian only” mall. That experiment seemed to work and over the past 20+ years Stephen Avenue has evolved into one of Canada’s best restaurant rows. However, that doesn’t mean it couldn’t be better. There are lots of times you could shoot a canon down the middle of Stephen Avenue and not hit anyone. To some, the idea that Stephen Avenue is a pedestrian mall first is sacred. To me, city building is just one big experiment and we should continue to try new ideas to add more vitality to all of our public spaces. Obviously there are lots of cyclists using Stephen Avenue Walk as a means of getting to work. Eight Avenue Place offers its tenant over 300 bike parking stalls, with adjacent showers, lockers and a private ramp and access card control. More and more the city is requiring developers to provide bike parking, which means we need to provide more cycling friendly streets to major new office developments. There is lots of room on Stephen Avenue Walk for cyclists and pedestrian to share the space. Even on the 300 block of Stephen Avenue Walk (SAW) there is lots of room for cyclists and pedestrians except for the busy lunch hour in the summer. This block has one of the highest concentration of office workers in North America with 200+ floors of office space, it makes sense to allow them to access the SAW by bike. Recently, I found a blog on the Urban Current website titled “The Failed Experiment of the American Pedestrian Mall” re: a new Downtown Fresno Partnership report that documented an 89% failure rate of American pedestrian malls. The study goes on to state 90% of America’s pedestrian malls have been converted back into main streets with roads, sidewalks, parking and have subsequently seen significant improvements in occupancy rates, retail sales, property values and private sector investment. While Stephen Avenue is a vibrant pedestrian area from 11 am to about 2 pm, Monday to Friday, from May to September, the rest of the time it could use more traffic. Allow cyclists to use the roadway as a means of getting to and from work during the week? Allow weekend recreational cyclist to ride downtown for lunch on a Stephen Avenue patio or shop at the Core or Bankers Hall? Maybe Calgarians would like to cycle downtown for an afternoon at the Glenbow or a matinee performance at the Epcor Centre? Experiment with allowing cyclist on Stephen Avenue this summer and see how popular it is? Then we could experiment next winter after the patios and vendors are gone with all day cycle access to Stephen Avenue. Vibrant streets are accessible by as many different modes of traffic as possible. One of the problems with North American’s downtowns is that we segregate, rather than integrate different modes of traffic. Downtown Calgary is perhaps one of the worst examples of segregation as we have separate streets for transit, pedestrians and cars and now maybe cyclists? Minneapolis’s Nicolette Mall for example is both a pedestrian and transit mall. Many European malls allow all forms of traffic, but with a pedestrian first (not only) hierarchy. In Paris, you will find the sidewalks used by drivers as parking spots! We need to learn to share! In Frankfurt pedestrian and cyclists share their "GREEN BEACH." Why can't we share our roads, pathways and other public spaces. Something that was also missing at the open house was a rigorous cost benefit analysis of the various options. I really wanted to know what some of the different options were going to cost and how many people could really be expected to use the new cycling tracks. There was one prediction that the 1St SE cycling track would double the number of cyclists using that street in the first year and then add 15 to 20% every year after that. However, I don’t know how that number was arrived at and I also wondered for how many years, might we see the 15 to 20% growth rate and at what cost. It is my understanding we currently don’t have good information on bike traffic because the numbers are collected only for one day or maybe one week of the year and so we don’t understand seasonal and weather variances. To get real numbers we would have to collect data at several times during the year and over different weather conditions. I read in one place only about 30% of the summer cyclists, cycle year round. On February 11, Tom Babin in his Calgary Herald Pedal Blog shared with his readers results from surveys of downtown winter cyclists by students of the University of Calgary’s Dr. Farnaz Sadeghpour. The students were able to survey 2,100 downtown winter cyclists, which means there must be at least that number if not more avid winter cyclists in downtown Calgary. There is no doubt in my mind there are more year-round cyclist in Calgary today than five years ago, no matter what the weather. Even when it is -30C out and snow and ice on the road, I regularly see cyclist braving the conditions. The question is how much do we invest in improving the cycling infrastructure to maximize our number of cyclists. So, I am wondering why we are jumping to the most expensive solution - separate bike lanes - when 83% of the people said more bike lanes on roads would be sufficient to encourage them to cycle more. I am always suspicious of human behavior survey results as humans are often guilty of responding with what would be their ideal behavior. Just because people say separate bike lanes would encourage them to cycle more doesn’t mean that they actually will. At some point we have to link vision with reality. I know in my case every summer I say I want to cycle more, but I never do and I am a fearless cyclist i.e. I am not afraid of riding on the road beside the cars. My issue is I have too many things to do in a day to be cycling everywhere, so I cycle nowhere. My bad! Bike racks at transit stops. We need to think about encouraging cycling across the city not just downtown. 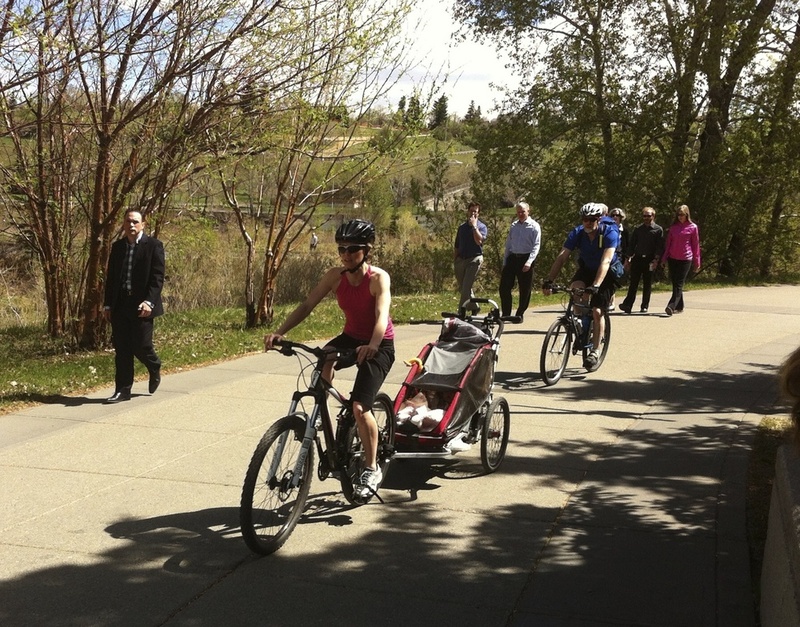 A weekday ride along the Bow River pathway downtown is fun for this family. We need to think about fostering recreational cycling as much as commuters. Lesson 1: Bike paths need to be groomed not cleared of snow every day. Lesson 2: Pathways are shared by pedestrians and cyclists. Lesson 4: Shorter is better. People aren’t going to cycle much more than 5 km in winter. Lesson 5: Innovate Experiment! Think share the road, share the sidewalk. Lesson 6: There is no template for making a city better for pedestrians and cyclists. Lesson 7: Cities must adapt not adopt ideas from other cities to meet the specific needs of their community. What is best for one city, isn’t necessarily best for another. Are we too downtown centric?